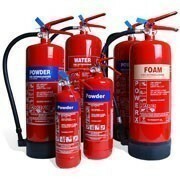 Budget fire extinguishers with 5 year warranty and every approval. Made to satisfy all budgets and authorities. 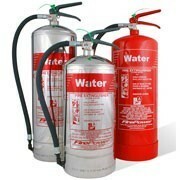 Water fire extinguishers for common Class A fires including water spray, water mist and freeze-protected. All are stand alone. 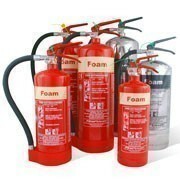 Foam fire extinguishers from Thomas Glover and Co and Firechief. 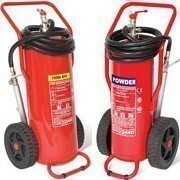 Includes stand alone and wheeled extinguishers. 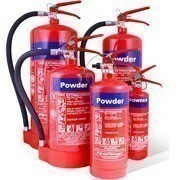 Powder fire extinguishers with a huge range from 1kg up to 9kg and then on to 100kg wheeled units. Includes chrome version for long life. 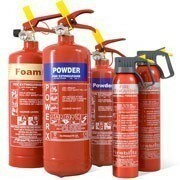 Car fire extinguishers and accessories to ensure your vehicle is protected from fire when on the move. Including torches, roadside warning triangles and first aid kits. Water fire extinguishers, also known as hydrospray, are smaller and more powerful than their plain water cousins so very popular for offices and shops. Automatic fire extinguishers are ideal for unsupervised locations and spaces. 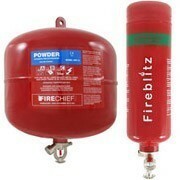 Includes a range of wall mounted and ceiling fire extinguishers in both powder and hi-tech gas types. Designer fire extinguishers are unique but still pack a punch. Including polished gold, chrome, and antique copper, ideal for shops and luxury spaces. 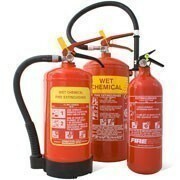 Wet chemical fire extinguishers for commercial and domestic kitchens with full approvals from 2 litre to 6 litre sizes. Includes Chrome extinguisher. Wheeled fire extinguishers built to move around sites. With foam, Monnex powder, powder and CO2 extinguishers and a special outdoor shelter option. 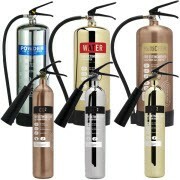 CO2 fire extinguishers from Firechief and Thomas Glover & Co. Includes chrome, wheeled and non-magnetic extinguishers. Antifreeze fire extinguishers built to withstand temperatures of -9 degrees centigrade. Includes both water and foam fire extinguisher options. Specialised fire extinguishers built to combat fires involding combustible metals, lithium batteries, and MRI scanners as an example. Includes standalone extinguishers and automatic ceiling mounted options. What colour code is displayed on a water fire extinguisher? In the UK, fire extinguishers are predominantly red since 1997. 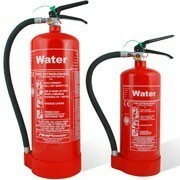 Water extinguishers would have a red colour coding so they do not need any additional colour. What colour code is displayed on a foam fire extinguisher? 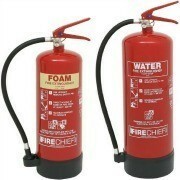 Foam extinguishers should be read with a cream colour coded area (not yellow) at the top of the main label area. It should be roughly 5% of the body area. Pre-1997 extinguishers were completely cream but these are likely past their usable life and should be replaced. What colour code is displayed on a powder fire extinguisher? Powder extinguishers of all types, including Monnex and Class D powders are red with a a blue colour panel above the instruction label area on the front of the extinguisher. If you have one that is blue only, it is pre-1997 and should be replaced as its beyond its lifespan. What colour code is displayed on a CO2 fire extinguisher? 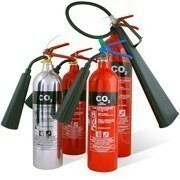 CO2 or carbon monoxide fire extinguishers are red with a black area above the instruction label. Any that are completely black are pre-1997 and that's beyond their hydraulic test dates. They should be removed by a certified extinguisher disposal professional. What colour code is displayed on a wet chemical fire extinguisher? Advances in technology ensure that the fire extinguisher has improved significantly over the last decade. More effective extinguishants have been developed to deal with a wide variety of fire scenarios and that means there is now a much wider range of different fire extinguishers available from us here at Fire Protection Online. Since October 2006, it has been a legal requirement for the owner/manager of virtually every kind of premise to ensure the safety of visitors by supplying and maintaining the right type of fire extinguishers. Powder extinguisher - but only when gas supply can be turned off otherwise you leave the potential for an explosion of the escaping gas. Homeowners should also take special care when buying fire extinguishers to pick a type that is able to deal with most fires likely to start around the home. Please note - Special attention should be paid to ensure that all versions are ALWAYS properly fixed to the wall or mounted on special fire extinguisher stands. They should never be used as door stops. Monthly checks should be carried out to make sure they are being stored appropriately and these inspections need to be recorded in a Fire Log Book. An annual maintenance service (or more if necessary) to BS 5306 part 3 should also be performed by a BAFE-approved technician. 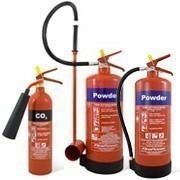 All Fire Protection Online's extinguishers have been manufactured by Thomas Glover and Company (part of UTC, along with Chubb Fire and Kidde) to the highest quality possible and have genuine full BAFE (British Approvals for Fire Equipment) certification, BSi Kitemark to BS EN3 and CE Mark (a legal requirement with the Pressure Equipment Directive - PED). Do not hesitate to get in touch with BAFE and BSi to check these approvals, as many cheap foreign imports claim to have them yet have no way of proving their credentials if questioned. There's no margin for error when lives are potentially at stake. Over 50,000 satisfied customers - including high-profile companies such as Google, Buckingham Palace and other Royal Palaces, the BBC, Jaguar, Top Gear, most UK Fire Brigades, most UK Councils, the Scottish and Welsh Governments, the Police, McLaren Racing, Williams F1, ASDA, Sainsbury's - have used Fire Protection Online and we sell more fire extinguishers online than anyone else. Fire extinguishers can save lives in the workplace or at home - so get protected without delay.